Snap Decision by Nathan Whitaker. The first book in the Truth, Lies, and Football Series. Review: Boom! Bang! Hit! A whistle, with little time left in the 4th quarter in a football game at the other team's side of the field. Chase, the QB was deciding what play to do as they trailed. Then suddenly he says, hike. Nervously, Chase caught the ball, with his sweat dripping down his uniform. Looking, dodging, duckingÉthen the game ended. Half of the fans cheered, and the other half of the fans cried, as they were depressed. If you want to read more, check out Snap Decision by Nathan Whitaker. 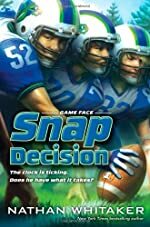 In Snap Decision, the main character is Chase, the quarter back for the junior varsity team. His team is called the Carr Loggerheads. The day after Chase had played against the Raiders, his coach wanted him to tryout for varsity football with his friends Drew, Solomon, and Nick. Chase had thought about it, he tried out and made the team. The good thing is he had made the Varsity team, but he wasn't the starting Q. The varsity team had made it to the state championship game against the Flagler Engineers. In the 4th quarter down by 6 with very little time left, the starting QB, Tripp, got injured. It is Chase's turn to get in the game and pump up the team. He wondered which play to call and how to execute it, with the ball on the other teams field. Next, the game gets really exciting. In my opinion, Chase is a great football player that never gives up. He is a huge role model to teach kids to focus on their goals. He is courageous, brave, and never has a doubt in his mind. When each chapter ended, everything was resolved. I didn't really like that because I wished the author had left me with a little suspense. The vocabulary was between a 5-6 grade levels, in my opinion, because all the words I had known. This book is a football, sporty, book. In my opinion this book is mostly for boys. Overall, Snap Decision is an entertaining book that teaches me anything can happen in the end. I would like to read this book again when I get older. Review written by Krishaan (6th grade student). We would like to thank ZonderKidz for providing a copy of Snap Decision for this review. Have you read Snap Decision? How would you rate it?